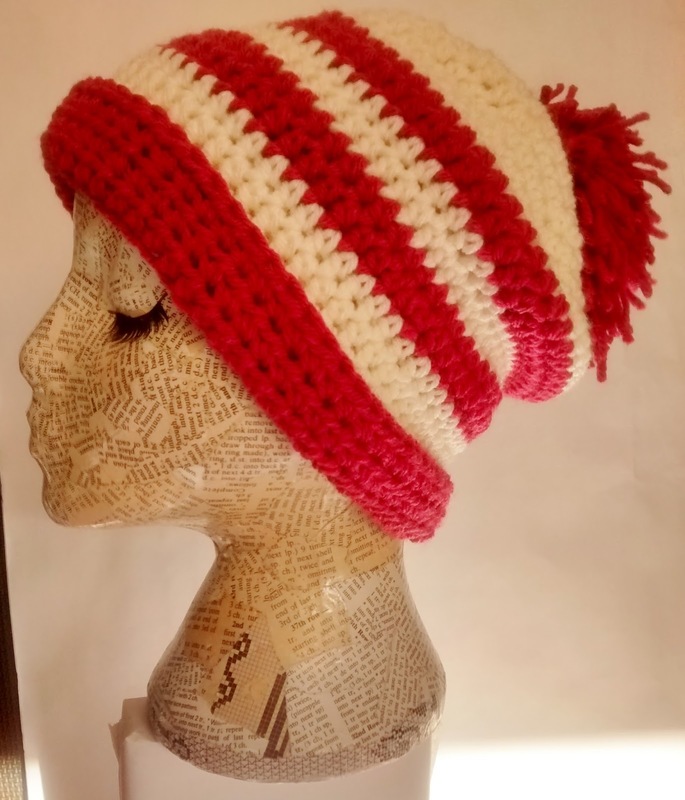 I promised I would share the hat pattern I use as a teaching tool. It is ideal for beginners as it involves just chain, slip stitch and half-treble (half-double in US terms). I use Stylecraft Special Chunky. A perfect yarn for a speedy project, cosy hat and happy newbies. It is good value, comes in a range of colours and is not very splitty. It is nice for a first crochet project to grow fast and a big hook with big stitches make teaching and learning much easier, too. Right, enough of the advert (no affiliation I promise - other chunky yarns are available and more experienced crocheters might want to choose something with more natural fibre for real luxury). If you teach crochet by all means use this pattern with your students if it is helpful. If you sell crochet by all means make to sell if you think your customers will like it. Please don't sell the pattern itself, though, and, if you share it, please credit String Theory Crochet. 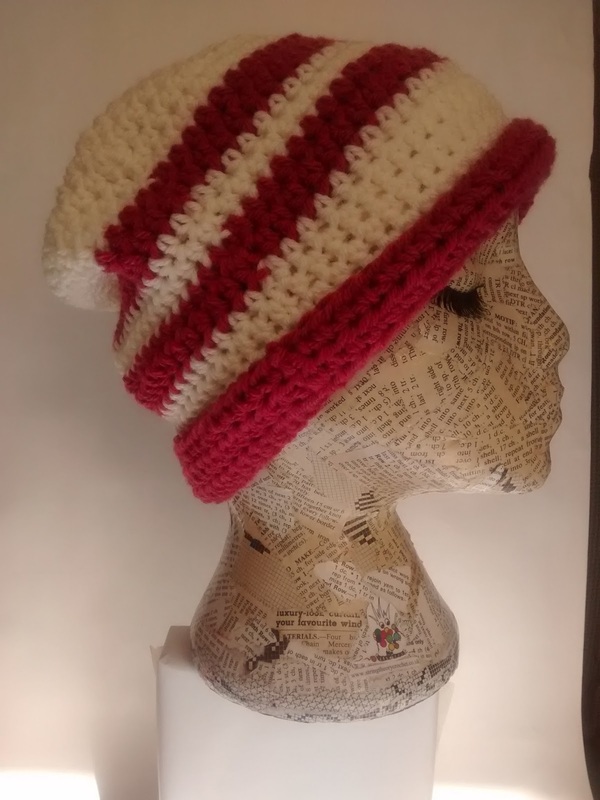 I call this a 24 hour hat but I can make one in a few hours. I am quite speedy now but it should be a super-fast project for anyone. Pom-pom optional. I'm sure you know how to make one so I've left out the instruction. Pattern makes a medium hat (approx 53cm/21 inches). Rounds 9 to 21 - Thirteen rounds with no increase: 1ch, 1htr in each, join with sl st.
For stripe pattern work 2 rounds neutral then 2 rounds bright four times, then work 4 rounds in neutral and 1 rounds in bright. Continue in bright colour for cuff. Want to change the size? For very big hats you might want to add rounds of straight crochet to the rounds 9-21 section too. For a smaller hat miss out increase rounds starting with round 8, then round 7 etc depending how small you need the hat to be. For very small hats you might need to take out some of the straight crochet rounds 9-21 as well. The science bit: Measure your head Eg 54cm. Divide by 3 = 18cm. Make increase rounds until your crochet circle measures about 18cm across and then start the straight crochet rounds. 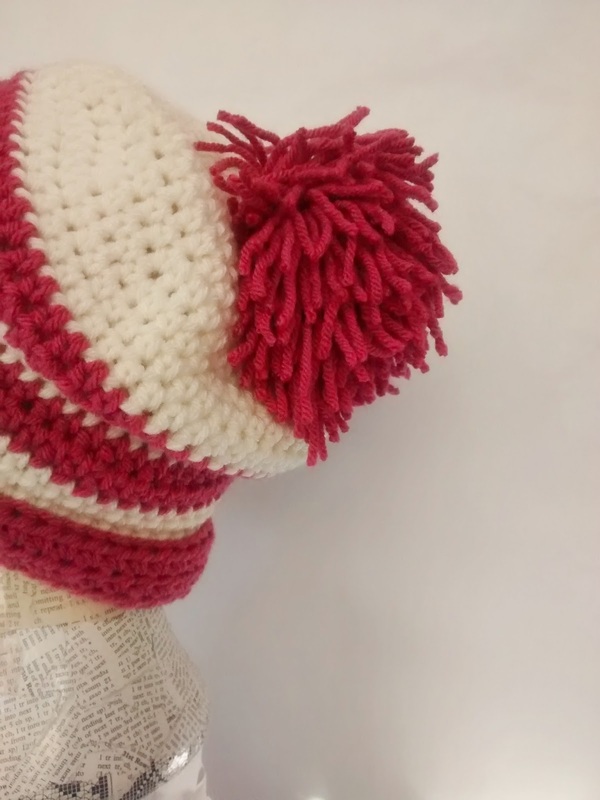 Measure from the top of your head (where your pom-pom will sit) to where you want your cuff to sit at the back or front of your head (eg about 17cm). Work straight crochet rounds for this length (eg 17cm) and then move onto the cuff. You will also need to think about your stripes if you add or remove straight rounds. Have fun! Let me know if you spot any mistakes and don't forget to pop over to our Facebook page and share your makes. Crochet Christmas prep is underway!